Earthworms provide a valuable service to your yard and garden, turning decaying vegetation into nutrients for your plants and aerating the soil with their tunnels. However, their hard work is only seasonal; they don't function well in extreme hot or cold temperatures, so they take a break and hibernate until the temperatures become more favorable. Worms need to hibernate because they can't regulate their own body temperatures. Often called cold-blooded, worms and other bugs are ectothermic. They rely on the temperature of the soil or air around them to keep their bodies warm or cool, and worms function best within a certain temperature range. Most perform best in soil temperatures ranging from 50 to 70 degrees Fahrenheit, but some can tolerate higher and lower temperatures, even down to freezing. When the soil temperatures drop enough that the worms start to become sluggish, it's not just their movements that slow. Their entire bodily functions begin to work less efficiently, so the worms hibernate to wait out the cold weather. They dig deep burrows, sometimes 6 feet or deeper under the surface. They create a pocket in the soil to hold oxygen, then the worms coat themselves with a protective blanket of mucus to help hold out the cold. The length of hibernation varies depending on location and the worms' tolerance for cold; the worms won't return to the surface until the soil rises to a desirable temperature. Worms don't just hide to avoid cold weather -- they perform a summer hibernation in some areas as well to keep away from hot temperatures, which can quickly dehydrate them. During summer hibernation, or estivation, an earthworm buries himself in a similar manner to winter hibernation and curls himself into a ball or knot to conserve moisture. He still coats himself in a layer of mucus, another method of keeping moisture inside his body as he sleeps. Although other environmental conditions might not drive the worms into hibernation, they can still be unhealthy. When there's a drought and the worms can't find enough moist soil near the surface, they tend to burrow deeper into safer soils, sometimes estivating until the drought passes. Too much water also is a problem, but only if it persists long term. Worms can survive underwater and in soggy soils for weeks, but if the conditions persist to the point that worms no longer have oxygen available in the immediate area, they die. 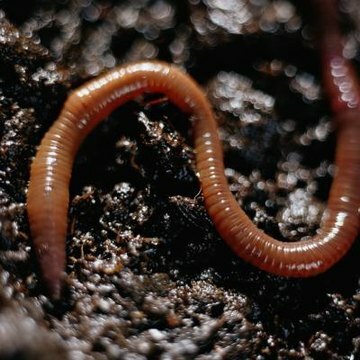 Milwaukee Journal: Do Worms Hibernate?